Kobayashi Kiyochika is known for his night scenes in much the same way that James McNeill Whistler is renowned for his Nocturnes. Both men were poets of the night, and will be featured in related exhibitions at the Freer|Sackler in 2014. 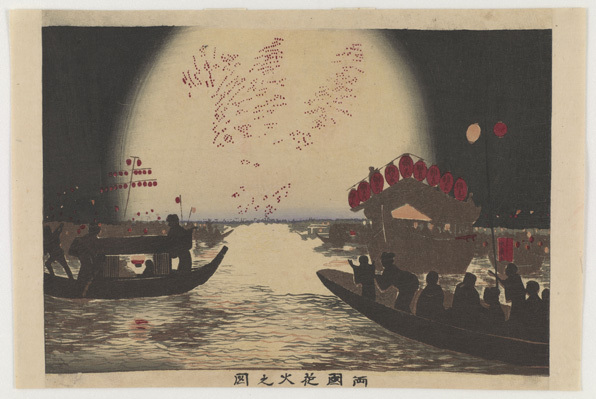 In Kiyochika’s Fireworks at Ryōgoku, two boats converge for Kawabiraki, a fireworks display held in mid-July to open the river to summer pleasure boats. In earlier times, fireworks had been used as part of a purification ritual to ward off summer illness. By Kiyochika’s time, the display had lost that earlier meaning and was more of a spectacle. Kiyochika is not the first artist to depict this scene, but his novel use of light to illuminate the foreground adds a cinematic touch to the print. The members of both boating parties—traveling in a palace boat (yakatabune) on the right and a roof boat (yanebune) at left—cast silhouettes that make the revelers look as if they were sailing across a movie screen. Happy July 4 from the Freer|Sackler!